After 27 years of marriage, Marilyn Anderson is tired of playing the role of perfect wife. Her husband Jim is a successful businessman who gives her everything she needs--a beautiful home in an upscale neighborhood, the financial freedom to be a stay-at-home mom, an enviable collection of stuff. Everything, that is, except what really matters: love. After years of trying to connect with Jim, Marilyn has had enough. She longs to experience some measure of happiness before she's too old to enjoy it. Needing some time to herself to sort things out, Marilyn leaves to start a new job and take dancing lessons--something she has wanted to do for as long as she can remember. Shocked to find his wife gone, Jim Anderson must sort through the past to save his marriage. With a little help from an unexpected ally, he begins a campaign to win Marilyn back. What he doesn't anticipate is how his actions will affect everyone around him--starting with himself. THE DANCE is the first book written by the Walsh/Smalley Duet and it is good… but not as stellar as what I’ve come to expect from Walsh. The book has a lot of telling in it. And as a student of writing and what makes it good, I couldn’t turn my internal editor off long enough to thorough enjoy it. I was rewording sentences as I read them to make them less telling. The plot line – as you can see above. Jim is all about Jim. Marilyn was only there to make his life easier. Who cares what she wanted? He certainly didn’t. So, despite warnings over the years, Jim was totally shocked to find out she left him. Even then, it was all about him. How dare she inconvenience him this way? He has to hire a maid to do his wife’s job. He is losing clients due to his wife not dressing him appropriately, or because she isn’t there. Dan Walsh is a great author, really. Despite the telling, I cared for Marilyn and Jim and their kids. I loved some of the secondary characters. And I read through the book in an afternoon. Some good lessons to be learned in the book. Recommended. 4.5 stars. $14.99. 352 pages. Reality Check -- When Should I Start? 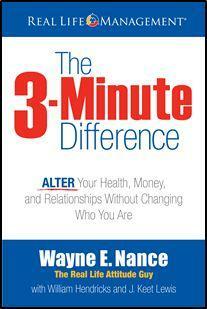 given to Wayne Nance, author of The 3 Minute Difference. In my Ten Point Plan on improving your health, fitness, and ultimately relationships point number two is the dreaded Reality Check. This is where you take the doctor's brutally honest assessment of your overall health and DO something NOW to get fit. In case you really follow the plan, and I am hoping that you do, you should weigh yourself first so that you can celebrate your results at the end of your fitness journey. Here is where you commit to setting the "opportunity" clock to wake you up from 30 minutes to an hour earlier in the morning so that you can get busy with getting active. I know this sounds very basic but get up and walk the dog, cat, pot bellied pig (no...I'm not referring to your spouse) and start with a short distance. VERY IMPORTANT--->Don't forget to stretch those muscles first so they can wake up too. You have to realize that this is new to them also and they will fight back at first until you show them who is the boss. My friend in NE Texas starts at 4:30 (now that is early) and lets his six year old Lab/Husky mix puppy pull him around his neighborhood. He said that she (his dog) is so excited to have this morning time with her best friend that she jumps almost 4 feet into the air and almost knocks him over. His relationship with his dog is definitely improving. Maybe he should take his wife along too, or maybe not...it is too early to attempt to wake her too. That could be dangerous, he says. This same man told me how to tell who your friends really are. DISCLAIMER: Fellows...DON'T TRY THIS AT HOME! He said to take your dog and your wife and put them both in the trunk of your car. Come back in an hour to let them out and see which one is happy to see you! Now that you are finished laughing, which by the way is great for your heart, I want to know how you are doing with the Reality Check. Send me your comments below. Let's have fun getting healthy this year. Giveaway promotion ! Please do one of two things..
2) Click the 4x4 Family dinner banner on the website www.SixSistersStuff.com (on the right sidebar) and leave a comment that they are joining the challenge. 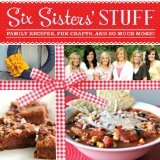 SIX SISTERS’ STUFF COOKBOOK is a collection of recipes, children’s crafts and lists such as healthy snacks, date night ideas, and stuff to do to keep kids’ busy on car trips (and more). We tried the black bean taco soup, the cheesy vegetable soup (with modifications, we didn’t have Velveeta on hand so we used shredded mild cheddar), the root beer cookies, and the breakfast casserole, because we did have the ingredients for them on-hand. It says the recipes all use common pantry items, but we don’t commonly have some of the things called for on hand for the recipes. I didn’t take pictures of the recipes. I should’ve. The cookies were interesting. Not great. I wouldn’t care to have them again. We all liked the black bean taco soup, the cheese soup, and the breakfast casserole. The children’s crafts and the lists were the best parts of the book – but even they weren’t super stupendous. Maybe if you never went on a long car trip with the kids, it’d be great, but for those who are used to traveling to see Grandma then they have their mental lists. I wasn’t overly impressed with the book, but my best friend loved it. She’s a huge list-maker though, and it intrigued her to have lists of healthy snacks, 14 days of Valentines, and more. So, I’d say if you are a young mom and keep a lot of convenience foods on hand, and need ideas to keep your kids busy, or a date-night for you and the hubs, then this book is for you. If you’re more into homemade, old-fashioned cooking, have a huge family and have done it all – well you wouldn’t be as interested. Oh and if you have a smart phone they have the little square bar codes so you can just scan it to go to get more recipes, instructions, and other great ideas. A great book for new moms and young moms. $21.99. 200 pages. 4 stars. 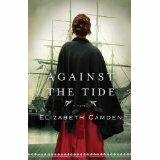 AGAINST THE TIDE is kind of a sequel to The Lady of Bolton Hill. Bane was a secondary character in that book, and not exactly a good guy. However, AGAINST THE TIDE easily stands alone. It’s an interesting story line dealing with the opium trade in the 1800’s. It was interesting to learn about the effects of addiction to this drug. Due to her upbringing, born of a Greek father and a Turkish mother, Lydia was raised on fishing boats, going from country to country. Her ability to learn languages came in handy though as she found work with the U.S. Navy. Alexander Banebridge hired her on the side to translate documents for him, but his mission could put Lydia in danger. Lydia was very tough, and meticulous, everything had to be in order before she could even think. Bane on the other hand was very mysterious. I did enjoy the story and it is very different than most historical novels I’ve read recently. $14.99. 368 pages. Grace’s beauty almost cost her everything. This new start is all she has left. When Grace Beiler was only a girl, she was married off to an older Amish man in order to save her family’s farm. Years later, she finds herself newly widowed and a mother to a young son. She has finally fled her sad past and plans to settle into a quiet life in Pennsylvania. As soon as she arrives, she captures the attention of Seth Wyse, the most eligible bachelor in Pine Creek. Seth is candid about his feelings for her, and for her son Abel, but Grace is determined to protect her heart. Her determination falters when her brother-in-law reveals the troubling contents of her late husband’s will. Seth offers Grace his hand in marriage, and thus a means of escape. But despite his having saved her from another loveless marriage, Grace is slow to trust her new husband. And as the months wear on, Seth wonders if he has made a mistake. But God is quietly at work in their hearts, and Seth and Grace soon discover that threads of grace bind them together in a tapestry rich in hope and love. THREADS OF GRACE is part of the Patch of Heaven series by Ms. Long, but it easily stands alone. For readers who want to read books in order though, Sarah’s Garden and Lilly’s Wedding Quilt are the first two in the series. I love Ms. Long’s contemporary Amish novels and novellas (not so much the historical one) and this one was no exception. Grace is suffering from marital abuse. Her husband has passed, but he’s emotionally and physically abused her so much, she’s broken. Seth is infatuated with the beautiful widow, and when he discovers her continued danger from her former husband’s brother, he’s quick to jump in to help. Maybe without thinking things through clearly, but Seth is impulsive. Such an awesome man. I fell right in love with him. Fans of Amish fiction won’t want to miss Ms. Long’s Patch of Heaven series, and particularly not THREADS OF GRACE. $15.99. 304 pages. 5 stars. Call for Survivor Stories of HOPE. The month of April is Sexual Abuse Awareness Month and also Child Abuse Prevention Month. During the month of April I will highlight YOUR stories of survival on the Just Show Up Blog. Requirements: At …least 500 words no more than 1000. No graphic details, focus on how you’ve survived, overcome the shame and what you are doing to thrive today. All submission are subject for approval and proofing/editing at my discretion. I’m looking forward to reading and sharing YOUR story of HOPE. Houston-based author/speaker reaches into the darkness of personal despair to offer a light of hope to victims of assault and abuse. Dallas/Fort Worth—A sexual assault takes place in this country every two minutes, though it is estimated only about 30 percent of the assaults are reported and only one assailant in 16 will ever spend a day in jail. In addition, statistics tell us five children in America die each day from abuse or neglect. Seventy-five percent of those are less than four years old. Most know their attacker. In an effort to shed light on the darkness surrounding these two equally prevalent and pervasive issues, April is designated nationwide as both Sexual Assault Awareness Month and Child Abuse Prevention Month. 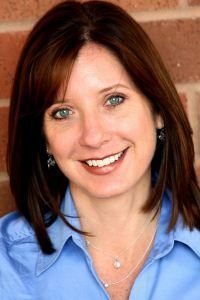 For international speaker and author Shannon Deitz, first raped when she was 17 and then again while in college, these national awareness campaigns are an opportunity to reach more people with the message that the abuse need not define the victim. Having endured not only the anguish of being abused as a child and assaulted twice, but also the self-judgment, condemnation and feelings of worthlessness that most often accompany such violations, Deitz knows firsthand just how detrimental sexual assault and child abuse can be to emotional and spiritual wellbeing. Today, her primary goal in life is to help other victims regain a sense of self-worth. “Both sexual assault and child abuse are so distressful to most of us that we don’t even want to think about them being present in our society,” Deitz says. “This makes it almost impossible for any victim of assault or abuse to feel comfortable enough to speak out, which is, of course, exactly what they need to be able to do. Be it a child, a teenager or an adult, anyone who has been abused needs to be able to speak about what has been done to them without question or judgment. According to Deitz, survivors of sexual abuse are three times more likely to suffer from depression, 13 times more likely to become addicted to alcohol and 26 more times more likely to develop an addiction to drugs. The shame, despair, depression and inability to cope with the painful events lead them to seek other ways to block out the memories and dull the pain. While the month of April will most certainly be marked by a series of prevention and awareness-raising directives designed to grab public attention, Deitz knows that a mere thirty days is not enough and it cannot stop there. Passionately sharing her own story every day through her blog and speaking events in hopes of igniting a desire in others to do the same, Deitz remains optimistic as she strives to offer hope and rekindle a sense of self-worth in every victim of abuse she meets. Emphasizing the importance of openness, Deitz tells victims, “If you have suffered abuse at any point in your life and it has debilitated your marriage, your intimate relationships and your friendships, or even caused you to distrust others in general, then I want you to know, as one survivor speaking to another, that you can overcome this. The more you talk about it, the more you will heal. And though the experience will never totally disappear from your past, it will become a chapter in your life that you can eventually close. Deitz should know. It was her willingness to share her stories with others, first through her award-winning book, Exposed: Inexcusable Me, Irreplaceable Him,and later through subsequent speaking engagements, that led to her own transformation. Today, Deitz continues reaching out to those who are suffering through her speaking engagements, her blog (Just Show Up) and her ministry website. Handsome Cowboy or Debonair Tycoon. How's a Girl to Choose? 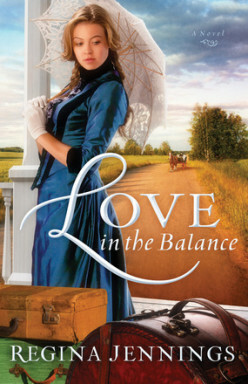 LOVE IN THE BALANCE is the sequel to Ms. Jennings’ Sixty Acres and a Bride. I greatly enjoyed her first book and looked forward to this one—but it wasn’t what I hoped. Unfortunately Molly was—ahem—very unkind. When Bailey asked for prayer in church regarding a temptation, she assumed (rightfully, but that was beside the point) that it was about her and she made a scene. She didn’t get much better as the book went on. Her parent’s needed her to marry money and so she dates her best friend’s boyfriend. Both under duress, but it hurt her friend. I won’t go on about her dating shenanigans, but I didn’t like Molly at all and I didn’t see what Bailey saw in her—other than her wonderful body. I really hate giving negative reviews, even though the author may not read them. So, I will add that Ms. Jennings did bring the characters to life, she used great descriptive terms and there were some parts of the book that piqued my interest. All in all – an okay read. $14.99. 368 pages. 2.5 stars, rounded up to 3. The number forty symbolizes the beginning of something new. It is an indication that God is ready to birth something new and exciting in the life of the believer out of pain or challenge. If you have been in a challenging place this book is for you. Over the years, Mr. Prrilliat has come to understand the significance of the number forty. Scientifically speaking, forty weeks is the length of time it takes for a mother to carry an unborn child from conception to delivery. Biblically speaking forty is the number associated with a period of testing before a breakthrough. As you read this book, you will experience the challenge to apply biblical principles for personal development, daily encouragement, authentic transformation, and restoration. Empowering words for life. KINGDOM PRINCIPLES FOR EVERY DAY LIVING starts with scripture, followed by a devotional that varies in length from a paragraph to a couple pages, and practical application with plenty of lines for writing your thoughts. This is a book that will transform you and your thinking as you work though it. A lot of thought is required with some of the devotions. Great book. $14.99. 122 pages. 5 stars. Minister, Father, Servant, Evangelist and Author. Stewart Bernard Perrilliat is a gifted individual who has a passion to see broken lives restored and renewed through a relationship with Jesus Christ. A native of Oakland, California, Stewart grew up in a community that was plagued with a number of challenging institutional socio-economic ills. Nevertheless, Stewart escaped the lures of the streets and became a Sergeant in the United States Marine Corp before becoming the Founder and CEO of Perrilliat Enterprises, a general contracting and engineering firm based in Northern California. Over the years, I have come to understand the significance of the number 40.
associated with a period of testing before a breakthrough. God brought a refreshing promise for His people. their 40 days turned into 40 years before they entered into the land of promise. their victory over the Philistine army. and 40 nights in the wilderness. concerning the number 40 inspired me to write this devotional. renewed life is the number 40.
for Everyday Living: 40 Practical Principals for a Fruitful Life. increase your knowledge of God, and strengthen your faith towards Him. Discover Together Bible Study Series Allows . . .
Sue Edwards and Kregel Publications challenge women to discover the Bible this year by inviting them to join in The Year of Discovery, an interactive online experience. With the launch of the Edwards’ Discover Together Bible Study Series, individuals and groups will be able to participate in their choice of seven different studies that actively dig into six books of the Bible. Q: Women often overcommit themselves and limit their Bible study time. How much time during a day or week is required for each Discover Together lesson? Women today are busy, but fast-paced full lives mean they need God’s Word to guide them just as much, maybe even more, than women in previous generations. Most women can complete a lesson in one to one and a half hours a week, and even with this minimum time commitment, they can expect an in-depth grasp of the text. The key is consistency. Understanding, really understanding, God’s Word will radically change your life if you apply what you learn. Where else can you get life change for an hour to an hour and a half a week? Q: How can women take part in The Year of Discovery? Choices. Women can participate in The Year of Discovery along with their Bible study groups at church. Or, if they can’t commit to another night out of the house for a group study or their work schedule keeps them on the road, they can still engage in meaningful study by completing the lessons themselves and then finding community and discussions on my new Facebook page (Facebook.com/DiscoverTogetherSeries). I’ll be leading women through one study after another in 2013. Check out the calendar and join us. Q: For those familiar with your Bible studies, what added features can readers expect from these new editions of the Discover Together Bible Study Series? The new studies sport updated designs, colors, and formats, with sidebars quoting inspirational authors, helpful background information, and my own related stories. “Digging Deeper” questions have been moved into the sidebar space. Also, we’ve added QR codes to take readers to free supplemental online teaching videos, most between three and five minutes each. The new website www.discovertogetherseries.com features these videos as well as an introductory video for each study, most around eight minutes in length, to jump start students as they begin their individual or group study. The leader’s guides, previously part of the study guide itself, can now be accessed online. We have also changed the way questions are numbered, making them easier to lead. We’ve done everything we can think of to make these studies user friendly and adaptable to a variety of study situations. Q: Tell us about what readers will learn by working through the “Digging Deeper” portions of the studies. “Digging Deeper” questions are for those who want to, and make time to, probe the text even more deeply. Answering these questions may require outside resources such as an atlas, Bible dictionary, or concordance; women may be asked to look up parallel passages for additional insight; or they may be encouraged to investigate the passage using an interlinear Greek-English text or Vine’s Expository Dictionary. This deeper study will challenge women to learn more about the history, culture, and geography related to the Bible, and to grapple with complex theological issues and differing views. Some with teaching gifts and an interest in advanced academics will enjoy exploring the depths of a passage, and might even find themselves creating outlines and charts and writing essays worthy of seminarians! Q: Something unique to these studies are the videos that have been created for each lesson. What can we expect from each video message? Some of the free online videos complement the question or question set adjacent to it in the lesson. Others relate to the general topic of the lesson. They are short, three to five minutes, and optional. Women can choose to listen to them all, or to none of them, as time and interest allow. In our sound bite world, short with high impact is often preferable to longer messages, although women who want to hear a longer message, thirty to forty-five minutes, will find some hiding among the shorter videos. Again, this Bible study series is about choices. Q: Most of the devotionals being released this year are revised editions of previous devotionals; the exception is Revelation. Is there a reason why you had not written a study on Revelation before now? Over my thirty-plus years of Bible teaching, students have requested Revelation more than any other book. Also, recently several respected Bible teachers have predicted that Jesus’ second coming is imminent, and that has heightened interest in studying the book that tells us more about his return than any other. I’m not making predictions, because Jesus told us in Acts 1:7, “It is not for you to know the times or dates the Father has set by his own authority.” I do agree however that we are living in unsettling times and we certainly could be the last generation, but I’m hesitant to insist that we definitely are. But all this speculation, as well as the unsettled world we now live in, convinced me that now was the time. Q: You actually pick a few specific chapters of Revelation to study rather than the entire book. Can you explain to us your choice? Revelation opens with a magnificent picture of the resurrected Christ. Following that overwhelming, dazzling picture are letters from Jesus to seven churches. They represent Christian communities throughout the ages. Imagine, letters from the resurrected Jesus to us! Throughout these letters, Jesus hints at rich promises and rewards that await the faithful when he ushers in the New Heavens and the New Earth, then eternity. We see the culmination of those promises and rewards at the end of the book. So going deep into the first and the last parts seemed like rich fare for hungry women. And, as I said, the middle is better taught by experts than a self-discovery method. Q: What was one of your favorite things about researching and writing this study? I’ve studied Jesus’ words in the Gospels, but I’d never gone deep into Revelation’s red-lettered words. I’d always assumed that John wrote the letters, but John was the scribe for Jesus. And Jesus’ words are particularly significant now because they are written in the context of end-times prophecy. They prepare us for what’s ahead. Q: Why are you excited about women studying Revelation? I’m hearing escalating, unsettling concerns related to the times in which we live. Globally, we are experiencing more natural disasters, economic strife, and political chaos, like birth pangs. How do we live in times like these? Revelation prepares us. And it is the only book in the Bible that promises blessings if we read and apply it. My fervent prayer and hope is that studying Revelation will calm concerns and bless women with a supernatural peace that only God can give. When it comes to money, attitude is everything. Carrie Rocha, founder and owner of Pocket Your Dollars.com, one of the most popular sites on the web, shares the secrets that will help you change the way you think about money. Seven years ago she and her husband were surprised to discover the mountain of debt they'd accumulated. They knew they'd have to make big changes. Thirty months later they were debt free and have stayed that way ever since. How did they do it? It wasn't through a step-by-step financial program or spending plan. It turns out, budgets can't fix everything--real change takes an attitude adjustment. You too can triumph over the pitfalls that lead to financial stress. With practical help in every chapter, including real-life examples and easy-to-use self-assessment tools, you'll soon understand what Carrie discovered: Lasting change can start today. She goes on to show us the skills we need to change our attitudes and some simple budgeting advice. Ms. Rocha also shares the story of how she and her husband paid off over $50,000 in about thirty months. POCKET YOUR DOLLARS ends with some practical tips- all of which I was already aware, except one. Buy your gas on Tuesdays. In some parts of the country, apparently, that's when gas prices are at their lowest. Wow. I tracked prices here to see if it was true, and it didn’t seem to be where I live. Nothing changed. But, maybe where you live it is true. 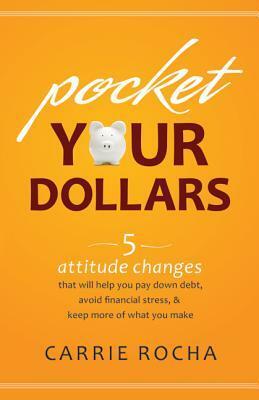 POCKET YOUR DOLLARS reminds us that money (or lack, thereof) is not the root of the problem, but rather it’s our attitudes. 3.5 stars. $13.99. 224 pages. How much would you risk to save another’s life? Flora has always disliked Bruce. He was unkind to her in school and she harbors grudges. Even when he returns home after an absence, she is unfriendly to him, especially after he accidentally insults her again. When her pastor asks her, her sister, and Bruce to accompany some run-away slaves north, Flora balks. It seems Bruce is experienced at working on the underground railroad, and knows the dangers. But this time, the female runaway is pregnant and likely not to make it to safety before giving birth. They need Flora to go along to help birth the baby if needed. Bruce seemed a really kind individual in this story, and so caring. He does say what he thinks getting himself into quite a lot of trouble, especially with Flora. Flora and Irene both are really bitter individuals, prone to hold grudges and be unkind. I didn’t like Flora much at the beginning. But the story was exciting, I had to keep reading to see what happens. And Flora did grow on me. This is an intriguing underground railroad story and should appeal to anyone who loves historical romances, underground railroads, and quilts. PATH OF FREEDOM is book three in Abingdon’s Quilts of Love series, but easily stands alone. The first two books were A Wild Goose Chase Christmas by Jennifer AlLee and Beyond the Storm by Carolyn Zane. Don’t miss PATH OF FREEDOM, or any of these great books. $12.99. 240 pages. A delightful novel for moms set in the hilarious, hard, and beautiful world of homeschooling. It's the perfect first book for those just starting out on their homeschooling journey, or beginning to consider the idea, and it's a reminder to the verteran homeschooler that you're not alone. It's sort of like living in the house of a homeschool family for a year. You see the daily challenges, but also the rewards. With refreshing humor and honesty, Hawkins offers moms encouragement in their noble work at home, a chance to laugh at the moments only a mom would understand, and a reminder to cherish those gifts right under their roofs- those wild, irrational, precious people-their own children. Though the book deals with homeschooling, it also addresses the larger question, "What happens when you feel called to do something that seems entirely too big for you?" Between laughs, don't be surprised when you pick up ideas that will simplify your own homeschooling plan. So, come join Julianne and her co-op friends as they navigate through a hard but humorous year of diapers, dinners, husbands, meltdowns, and math lessons. And that's just September. THE HOMESCHOOL EXPERIMENT is a fiction account of a homeschool mom. Written in first person, it gives an up-close and personal look at the mindset of a homeschooler, including the doubts, the thoughts, the stubbornness, and the determination. I’ve been homeschooling for many years—a veteran homeschooler, and I could totally relate to Julianne’s thoughts about using vacation trips as a homeschool experience, about how the in-laws think you aren’t good enough and are ruining the kids’ lives, and about trying to choose the correct curriculum for your family. It just goes to show that everyone’s approach for homeschooling is different. There’s no one right way. If you are homeschooling, thinking about it, or know someone who does and you’re a bit curious, then pick up THE HOMESCHOOL EXPERIMENT. You’ll laugh out loud, be encouraged, and maybe even learn something. A study guide and a bunch of resources are included at the end of the book. $12.99. 260 pages.